Nearly every day, Rich goes off on his morning rounds. Camera in hand, he’s in search of birds, sunrise or both. I usually opt for an early morning run, or other outdoor workout. But this morning’s “springy” 18 degree temperature with a cold wind gave me pause to reconsider running in the afternoon sunshine instead. Since Rich’s route would take him around the harbor this morning, I decided to accompany him. I may not be a bird aficionado, but I do so love the water. We began our harbor tour at Miller Creek, and worked our way eastward. There we found a flock of Canada geese who weren’t too pleased with our intrusion. They immediately fled from the open water onto the wet ice, some of them comically falling through the thin glaze in their haste. And they did add some local flavor to the distant view of the bridge. From there we went to the end of Garfield Avenue, under the High Bridge (since the day it was built, that will forever be its name to me!). 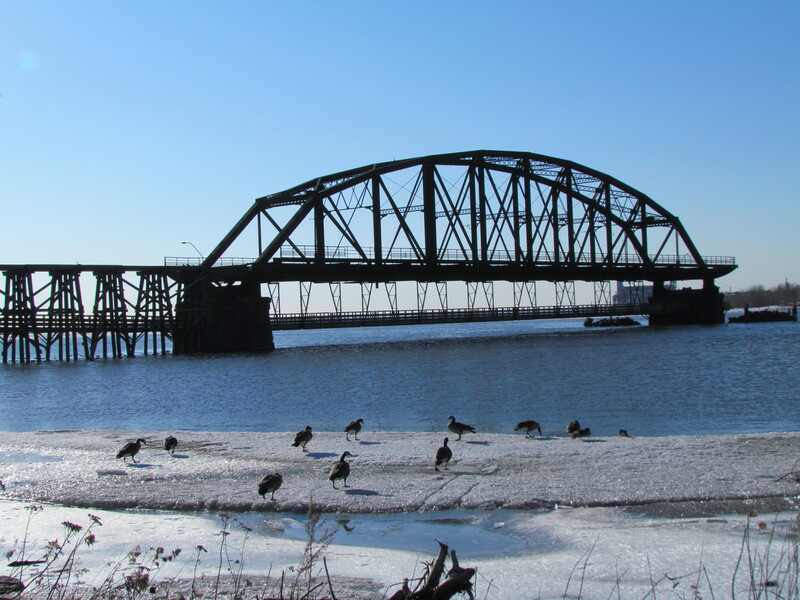 At the old Interstate Bridge, now converted to a walking and fishing pier, we were met by yet more geese. They were equally thrilled with our presence. I’d never walked out on the old bridge, and this was a beautiful morning to do so. I loved the way they suspended the walkway under the old railroad bridge span, that used to swing freely on one end to form an opening for boat traffic. The repetition and symmetry of the bridge parts appealed to me, as well as the contrast between the old weather beaten wood and the gleaming metal framework of the High Bridge. 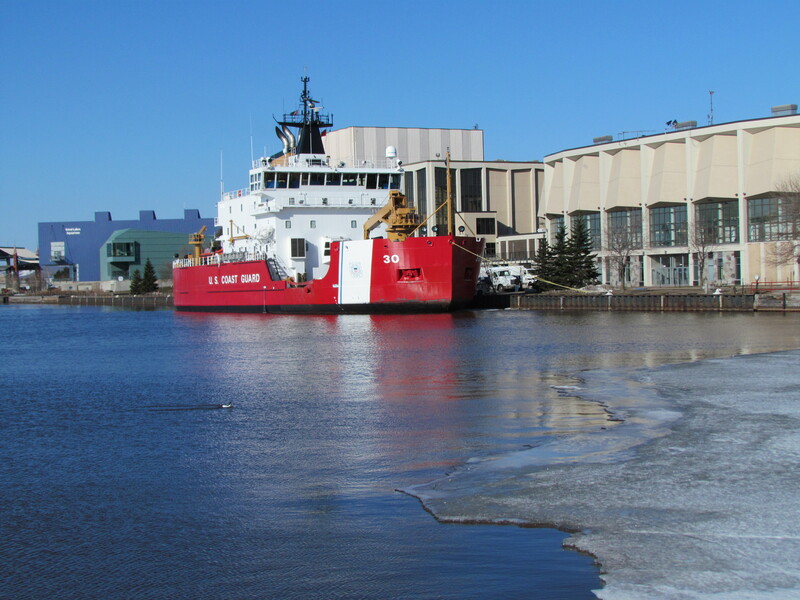 Behind the Arena (okay, another old name) we found the ice cutter Mackinaw. In preparation for leading a convoy of boats to the Sault, it was being serviced by not one but two oil trucks. Who would have thought that would still necessary in mid-April? No harbor visit would be complete without Canal Park. The gates to the end of the south pier had opened within the last few days, so we crossed over the bridge to walk down its length. A hearty fisherman was peering over the side as he brought in not a fish but a thermometer. Thirty-two degrees he declared. Brrrr! Everything’s a month behind, he informed us. 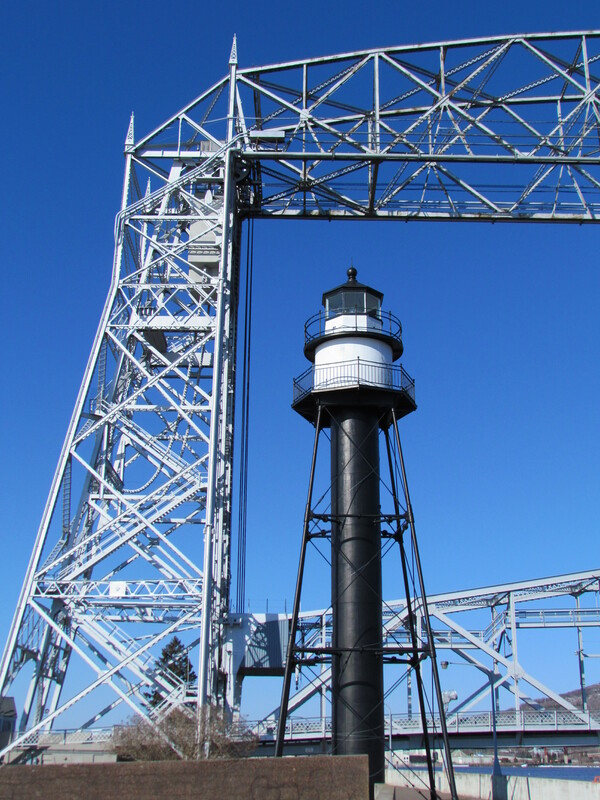 I was fascinated to learn recently that the Inner South Breakwater Lighthouse is actually owned by two citizens of Duluth. Deemed no longer necessary by the Coast Guard, and with no interested non-profit organizations, it was purchased through an online auction. Interesting just what you can buy on the web. Rich got his bird photos, and I relished my time beside the water. The brisk sunny morning left me chilled but happy with my choice. It was a good morning for hanging around the harbor. And I really enjoyed my afternoon run. This entry was posted in Life Up North by Molly. Bookmark the permalink.